Lips, Karen R. 2016. Overview of chytrid emergence and impacts on amphibians. Philosophical Transactions of the Royal Society B: Biological Sciences, Vol. 371, Issue. 1709, p. 20150465. Carey, C 2000. Infectious disease and worldwide declines of amphibian populations, with comments on emerging diseases in coral reef organisms and in humans.. Environmental Health Perspectives, Vol. 108, Issue. suppl 1, p. 143. Carey, Cynthia Cohen, Nicholas and Rollins-Smith, Louise 1999. Amphibian declines: an immunological perspective. Developmental & Comparative Immunology, Vol. 23, Issue. 6, p. 459. Beiswenger, Ronald E. 1986. An endangered species, the Wyoming toad Bufo hemiophrys baxteri—The importance of an early warning system. Biological Conservation, Vol. 37, Issue. 1, p. 59. Staff Herpetologist, Office of Endangered Species, US Fish and Wildlife Service, Department of the Interior, Washington, D.C. 20240, USA. Baxter, George T. & Meyer, J.S. (1982). 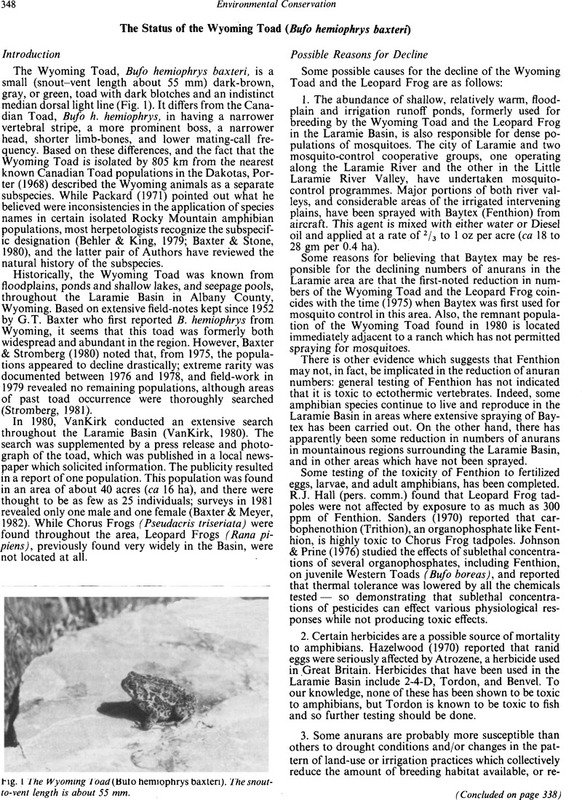 The status and decline of the Wyoming toad, Bufo hemiophrys baxteri. J. Colo.-Wyo. Acad. Sci., 14(1), p. 33. Baxter, George T. & Stromberg, M. (1980). Status Report. Rep. to US Fish and Wildlife Service, Denver, Colorado, USA: 5 pp. (mimeogr.). Behler, John L. & King, F.W. (1979). The Audubon Society Field Guide to North American Reptiles and Amphibians. Alfred A. Knopf, New York, NY, USA: 719 pp., illustr. Hazelwood, Ellen (1970). Frog pond contaminated. Brit. J. Herpetol., 4, pp. 177–85. Johnson, C.R. & Prine, J.E. (1976). The effects of sublethal concentrations of organophosphorus insecticides and an insect growth-regulator on temperature tolerance in hydrated and dehydrated juvenile Western Toads, Bufo boreas. Comp. Biochem. Physiol., 53A, pp. 147–9. Packard, Gary C. (1971). Inconsistency in application of the biological species concept to disjunct populations of anurans in southeastern Wyoming and north-central Colorado. J. Herpetol., 5(3–4), pp. 191–3. Porter, Kenneth R. (1968). Evolutionary status of a relict population of Bufo hemiophrys Cope. Evolution, 22(3), pp. 583–94. Sanders, H.O. (1970). Pesticide toxicities to tadpoles of the western Chorus Frog, Pseudacris triseriata, and Fowler's Toad, Bufo woodhousei fowleri. Copeia, 1970, pp. 246–51. Stromberg, Mark R., (1981). Wyoming Toad (Bufo hemiophrys baxteri) endangered. J. Colo.-Wyo. Acad. Sci., 13(1), p. 47. Vankirk, Edward A. (1980). Report on Population of Bufo hemiophrys on Laramie Plain, Albany County, Wyoming. Rep. to Wyoming Natural Heritage Program, The Nature Conservancy, Cheyenne, Wyoming, US: 6 pp. (mimeogr. ).